If you’ve ever flown into Denver, you likely experienced turbulence—perhaps even extreme turbulence—because the airspace in and around Denver is some of the roughest in the nation. The wind flow across the rugged terrain of the Rocky Mountains is to blame. Even though frequent fliers know what to expect, the experience can still be distressing. It’s rather like being an equity investor. The current Trump-initiated tariff/trade wars. 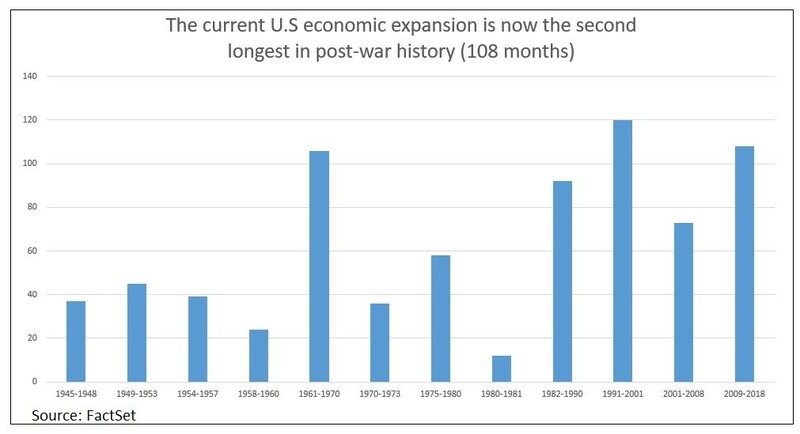 The length of the current economic expansion/bull market. In 1817, British political economist David Ricardo published what has since become known as the theory of comparative advantage. Even when one country’s workers are more efficient at producing every single good than workers in other countries, that country will still engage in international trade, exporting the goods for which it has a comparative advantage while importing other goods, as long as there are differences in labor productivity between countries. The free-market political corollary is that all tariffs should be zero. When Alexander Hamilton was Treasury Secretary, he recommended subsidies (over tariffs ) to support manufacturers—an approach rejected by Congress at the time. In fact, the U.S. had high tariffs with varying rates through the end of World War II. Thus, Mr. Trump is not the first president, nor will he be the last—of either party—to fail to grasp the basic economics of international trade and/or choose to ignore them in favor of some political purpose. So be it. And while it is undeniable that tariffs are effectively a tax, and therefore a drag on both earnings and productivity, over the last century, equities have still generated annual total returns of about 10%—regardless of the nation’s prevailing tax and tariff policies. Frightening though the idea of a trade war may be, it’s just one form of economic turbulence. Six months from today, the impending apocalypse du jour will be something else. According to data tracked since 1854 by the National Bureau of Economic Research, we are now in the second longest economic expansion in U.S. history. At 108 months, the current expansion just surpassed the 1961-1970 expansion of 106 months. The next milestone is 120 months, which was the length of the 1991-2001 expansion. Not only that, but the current bull market turned 9 years old back in March. At its current level of about 2,800, the S&P 500 is more than four times higher than its March 2009 bear market low of 677. So we’ve got an early-stage trade war combined with the second longest economic expansion/bull market in U.S. history. Nevertheless, the only rational action for an investor to take is …nothing. That’s right, do nothing. Here’s why. The average annual drawdown for equities is 14%. Based on historical frequency, we’re statistically overdue for a bear market—a stock market decline of at least 20%. Between 1947 and 2017, the S&P 500 had 11 such declines, about one every 6.4 years, with an average peak-to-trough decline of 34%. After each of these temporary declines, though, the equity market then resumed its permanent advance of both values and dividends. Statistically, the average person will experience eight bear markets in a 40-year working career and six more in a 30-year retirement, but rational equity investors should be willing to ride out those declines. Why? Because over the long term—and which should be the relevant time horizon for most investors, equities have compounded at a return 7 percentage points above inflation. 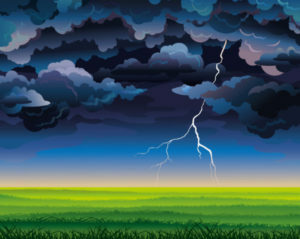 Thus, the biggest challenge that investors face is one of temperament. To be a successful equity investor, you have to be able to ride out both 14% average annual peak-to-trough declines and temporary bear market declines of about a third of your portfolio value every six years or so. Most investors can’t do it (i.e., sit tight and do nothing to their portfolios). Invariably, they sell low and buy high. And the consequences of such self-inflicted behavioral wounds are profound. A solid multidecade financial plan includes a cash reserve for emergencies and allocates funds for capital commitments occurring within five years to bonds. The remainder of the portfolio should be invested in equities, not in spite of volatility but because of it—which, after all, is the reason for the superior returns provided by equities. If you receive a lump sum, whether through an inheritance or the sale of a business, for best results, statistically speaking, you should invest it in equities by nightfall, minimizing the chance that you will miss one of those peak performance days. If the fear of investing at what could be a temporary top is simply more than you can handle temperamentally, then average into the market systematically over some predetermined length of time. Although not mathematically ideal, it’s better than the alternative of trying to time the market, which tends to provide the worst results overall. If you’re already fully invested in equities as part of a well-constructed, multidecade financial plan, then do nothing. Today it may be a trade war; tomorrow it could be rising interest rates or elections. But whatever happens, rest assured this too shall pass.